Candlestick charts first appeared as far back as the early 1800s, and as with anything in trading, many people claimed credit for the idea. This type of analysis is commonly thought to have been developed by a rice trader named Homma who was from the small town of Sakata in Japan. Pre-dating the western bar chart by a century, Homma created what were to become modern candlestick charts because he realized that rather than supply and demand, it was trader emotion that was the biggest variable driving the price swings in rice. Candlesticks display all the market information you need such as the open, close, high, and low. However, they also show the level of emotional volatility within that trading period. These emotional swings in traders can be shown through patterns that we will dig deeper into later. Each candle represents the trading activity for whatever period of chart you are looking at on a stock, index, or other trading instruments. If its an hourly chart, each candle represents one hour of trading, a 5-minute chart means each candle is 5 minutes and so on. 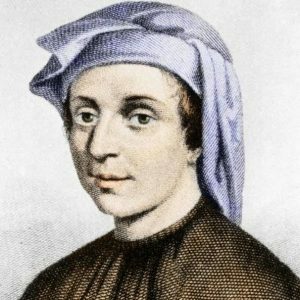 Regardless of time period, each candle is made up of two components and can be used in exactly the same way to conduct the analysis. However, the way these two components are shown can differ based on regular vs. hollow candles. Figure 2: Hollow Candles. A hollow green candlestick forms when the price closes higher than the previous time period. Figure 3: Hollow Candles. A red candlestick forms when the price closes lower than the previous time period. The first component is the candle body, usually shown as a rectangle or square shape, depending on the price action. The second component, the wick, is the line that exists on the top and bottom of the candle’s body and shows the high and low extremes for a particular time period. Through these two components, we can see at a glance the opening price, closing price, highest and lowest prices of the market for that period. The main body of the candle shows us the opening price and closing price for the period, as well as the direction of the market for that specific time. Candles can be drawn in any colors you choose using modern trading software. However, the most common are green bodies for a rising price and red for a falling price but most software will let you change to whatever color arrangement you want. If the main body is green, this indicates the price is trading higher than the previous close. By contrast, a red candle body indicates the price is trading below the previous close. 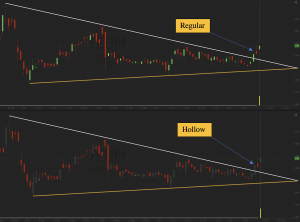 Color is a huge determining factor for candle analysis but identifying the difference between a solid and hollow candle chart can be just as important. With solid candle analysis, the candle is solid regardless of the move. However, with hollow candles, more information can be extracted quicker as there more setups to watch. Figure 4: Regular vs. Hollow Candles. As you can see from above, a candle gives you the high, low, open, close and market direction in an easy-to-read, visual form. However, their usefulness is not in what an individual candlestick can do, but the patterns that they form and the information that can be used from them. 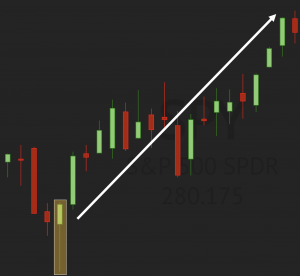 Recognizing candle patterns is one of the first skills you should learn in your trading journey, but it’s not just about seeing the pattern, understanding what it is showing you and how you can develop profitable candlestick trading strategies is key. The value in all the patterns that are commonly used for trading is that they can be used to potentially predict future price action. Being able to spot patterns forming early on and getting in on trades before they breakout has proven to be a profitable strategy for many successful traders. The beauty of this is that the more traders use these patterns, the more self-fulling the future moves become. As many of these patterns can be grouped into subgroups, we will explore each group below and explain their significance. There are four versions of the pattern that either form at the top and bottom of a trend, here is everything you need to know. The hammer pattern describes a candle that has a long wick underneath (the shadow) and a small body at the top that is at most half the length of the shadow. While the name is all about the resemblance to a hammer, to understand the psychological aspects of this, we need to explore this in more detail. 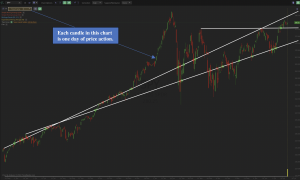 The shadow is formed when the stock or other security the chart represents trades much lower than its opening price, but then rallies and closes near or above the open price, creating that small body at the top. But what does that actually mean? On a downtrend, it can signify areas in which demand has returned after an overreaction occurred and smart money came in to buy the value. On an uptrend, it may mean an overreaction occurred and smart money came in to sell the inefficiency that was created from a euphoric move. For trading, what this means is a potential trend reversal in either direction. The longer the shadow, the more likely the reversal, and if the close is higher than the open, that is, a body showing an upward trend as well, then it is an even clearer signal that the trend is turning. 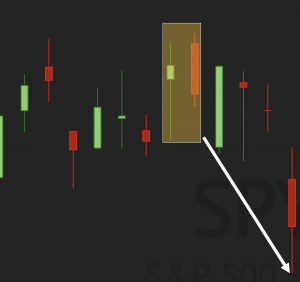 Out of all candlestick patterns, this set up is likely the most popular that is used by traders. As with all candlestick trading strategies, confirming the signal is the first step of the trade. That means waiting for the next candle to close, and it should end with a higher low than the hammer candle. Candlestick pattern trading is all about patience and observing the market. If the next candle has a higher low, that means that the support has held and the buyers are now outpacing sellers in the market. 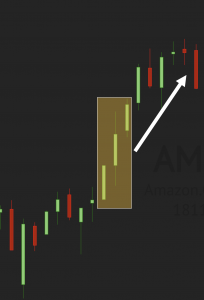 How traders use hammer candlesticks to enter the trade varies, one simple strategy is after a successful confirmation of the next candle, buy into the market if the price rises above that candle high, others prefer a more cautious approach and seek to confirm the new direction further. Whichever strategy is taken, the key point of a hammer is the signal of a change in direction and status quo in the market. An inverted hammer is where the body appears at the bottom of the candle, with a long wick above it. That is caused by the price rising significantly above the open price, and then retreating again to close near or below the open price. Again, this can appear at the bottom of a downtrend, but what is behind the price moves that cause it. What the inverted hammer shows is that buyers moved the price up significantly but met resistance and the candle ultimately closed roughly where it started. That shows that buyers were starting to lead the direction, and it is another good indicator of a change in direction. As with the hammer and all candlestick pattern trading, confirmation is important, with the next candle closing at a higher low than the signal candle. Again, candlestick trading strategies vary, but setting a buy in point higher then the high of the confirmation candle works for some, and it can help get into a new upwards trend very early. 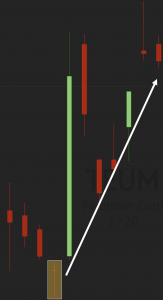 A hanging man candle formation is a variation of the hammer except that it shows up at the top of the trend. The hanging man essentially is showing that enough supply was loaded onto the market to drive the price down intra-day but demand was still strong enough to absorb this short term. However, notice how price starts to trend downwards over the next 15 or so time periods. A shooting star is another variation of the hammer that forms at the top of the trend. This is essentially an upside down hammer that shows heavy intraday buying pushing price to new highs but then heavy selling adding supply to the market causing the price to move back down near the open. Price then continues to drop over the next few time periods. 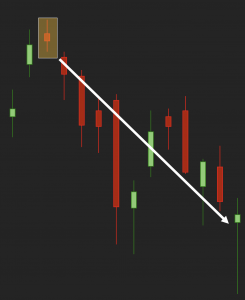 The Doji candlestick pattern is one of the most commonly used candlestick trading patterns, and it has proven to be a reliable indicator. 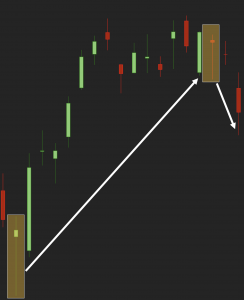 All Doji candlestick patterns share the basic candlestick shape, which is a candle with an open and close very close to each other, creating a small or non-existing body. This is a three-candle trading pattern with the middle candle actually being the “morning star”. The middle candle will have a closing price below of the first candle on the bullish morning star pattern, showing a turn towards an uptrend after bottoming out. The evening star doji has the same setup as the morning star doji except for the placement on the chart which is at the top of a trend instead of the bottom. Notice here the evening star doji formed shortly after a gap up in price. This gap quickly filled after the evening star formation. This Doji has a long wick above and below the body, and it is the strongest signal of a reversal of the five. As shown in the image above, this can be both bullish or bearish based on what side of the trend it is on. This form of the Doji has an upper wick, but no lower, with the body forming at the base of the candle. It is a powerful signal of a reversal leading to a downward trend. 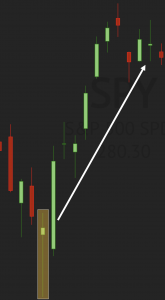 The opposite of this, with the body at the top and signifying an upward trend, is called a Dragonfly Doji. 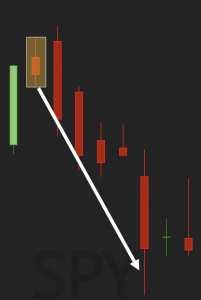 A neutral Doji is a candle that features small wicks, demonstrating a tight range of price movement. 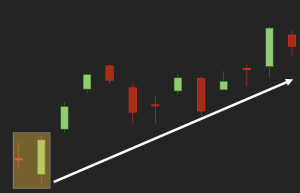 While it can indicate a reversal, this type of Doji requires careful examination of the candles before and afterward to determine the trend direction. Perhaps the most striking of all the candlestick trading patterns that you see frequently on charts, the engulfing candle, is not just a single candle as previous patterns, but two candles. There are two forms of this, bullish and bearish engulfing patterns, here is how each works. A bullish engulfing candlestick pattern usually occurs at the bottom of a downtrend, and it consists of two candles, the first, smaller candle that reflects the current trend, so a body signifying a lower close than open on a downward trend. The second candle has a body showing the opposite, so a higher close than open, with that second candle body completely overlapping, or engulfing, the body of the previous candle. While this can be a good sign of a reversal, turning a downtrend to an upwards one, confirming that change is important. 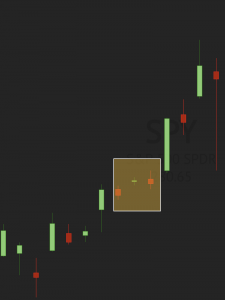 For effective candlestick strategies using engulfing patterns, this means looking at the preceding and following candles to see where the market is going. A reversal should become clear quite quickly, and as with other candlestick trading strategies, choosing entry points for the trade is down to personal preference. A bearish engulfing pattern appears at the top of an upward trend to signify the possible change of direction short term. Here, the smaller first candle will have a body with a higher close than open. The second, larger candle, features a gap up from the previous close followed by lower close than the previous open, entirely engulfing the previous candle. Volume preceding this setup will generally be the confirmation traders are looking for. Knowing how to trade with candlesticks means understanding the most common of them so that you can take advantage of any opportunity the market gives throws your way. 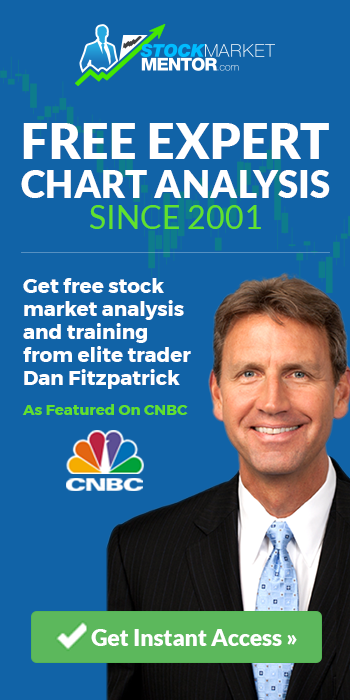 However, there are numerous candlestick trading strategies utilized which use less commonly used candlestick. A big part of staying ahead of the game is being able to recognize some of these other candlestick patterns other traders may not be paying attention to. We explore some of these below! Some signals can show both Bullish (Upwards) and Bearish (Downwards), movement, depending on the context they appear. Candles that appear against the trend, especially with a large movement backed by volume, show a potential significant change of direction. They can often occur as a result of fundamental news that affects markets, such as earnings or a status quo changing press release. When a very large change occurs in a single candle, it is a strong sign that a potential change of overall market direction is taking place. 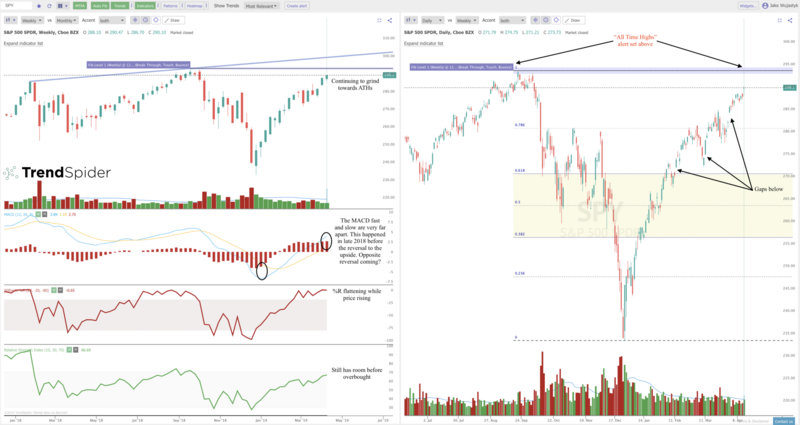 Seen as a signal for a short-term reversal to either direction, this two-candle setup is one of the stronger ones around for technical trading. This setup starts with the first a candle that moves strongly in either direction. The second candle then follows as a gap up (bearish setup) or gap down (bullish setup) with a close that pierces through the previous candles line. 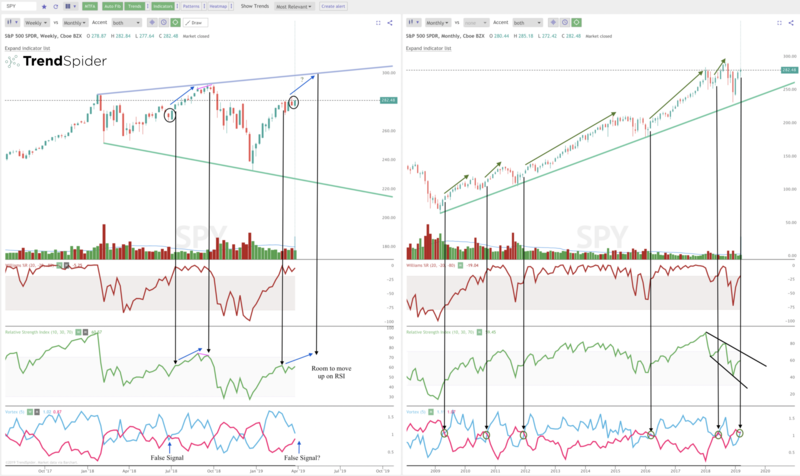 This setup is a great depiction of buyers and sellers struggling to find direction within a specific time period. As with all candle setups, this time frame can be applied anywhere from the 1-minute candle to the 1-week candle. The abandoned baby pattern is a three-candle set up that consists of a candle matching the current trend followed by a gap up or down (depending on the direction of the trend) and finally closing as a Doji or small bodied candle. The final candle is the opposite direction to the first, and it signifies the change in trend direction with volume confirmation still needed for a full reversal. When this pattern appears after a sharp movement either up or down, it is a very reliable indicator of a change in direction. Although it is quite similar to the morning and evening star patterns, it is a rarer occurrence, but a more reliable one. In this patter, the body of each candle is shorter than the previous candle in the pattern. 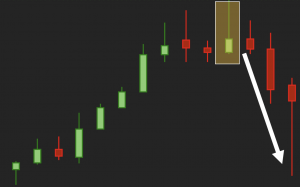 Typically a signal for a bearish reversal, the advance block candlestick patters consists of three candles. The first candle is the same direction as the trend. The second candle is again an upwards one, with an opening price within the range of the previous candle’s body and a closing price higher than that previous candle. The third candle is again an upwards candle, and again it has an opening price within the body of the previous candle and a closing price above the previous., with the shadows of the second and third candles being longer than the one of the first candle. This pattern is generally a depiction of the weakening of the buyers and a signal that the trend is peaking and set to reverse. As with all candlestick trading strategies, entry into a trade depends on confirmation of the trend change with following candles. A potential indication the end of an uptrend and the beginning of a reversal is coming, Dark Cloud Cover is a two-candle formation that begins with a candle that follows the overall trend (short term or long term depending which time frame you are on). The second candle is the opposite direction, with an open price well above the closing price of the first candle, creating a significant gap in price to the upside. The second candle must close below the midpoint of the first candle. For confirmation of the change in direction, the following candle should close below the close of the second candle. This pattern shows the buyers under pressure and the sellers overcoming them at the top of a trend, and it is a reliable mark towards a short-term downturn at a minimum. 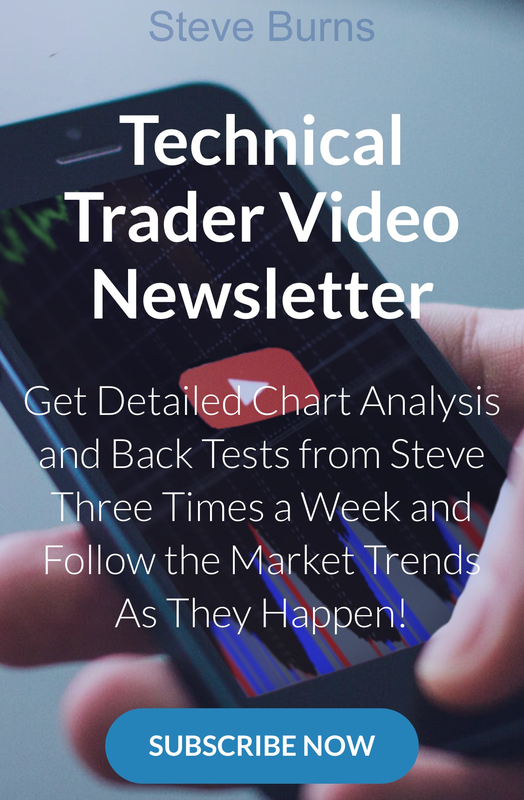 The key with candlestick pattern trading is recognizing the patterns on your chart. It is very easy to look at old charts and pick out the patterns, but somewhat more of a challenge to do it in real time on a live chart. Once a pattern is identified, it is vital to confirm a change of direction before entering a trade, as with all trading, nothing is 100% accurate and sometimes the market throws a curveball and does something unexpected. There are so many ways to trade candlestick chart patterns, but it is important to form your strategy beforehand. Planning out your entry, stop loss, and exit all help you mitigate risk and take emotion out of the picture. For many, a common strategy is to wait for two candles in the new direction, then enter the chart above the high point of those candles the next time it is reached. There are many alternatives to this, so finding one that suits your style is a crucial part of success in the markets. For stop losses, a common area to place it is just below the low point of the reversal signal, or the high point for a move downwards. However, sometimes it is important to add a little extra cushion in case HFT (high-frequency trading) machines are looking for a group of stop losses to take out below. Having an exit point is crucial to being a successful trader. Sticking to a safer approach, it could be that you hold until the next candlestick pattern indicating another reversal arrives but moving stop losses up along the way to lock in some profits if the price reverses down quicker than expected. Others prefer to stick with trades for a certain period of time, or they look for a specific profit before exiting. With many different strategies and ideas all currently trading in the marketplace at the same time, the only thing guaranteed is that nothing is guaranteed. This makes the stock market one of the most fascinating natural economic forces to watch. As we mentioned earlier, recognizing the patterns quickly over a long period of time can be a challenge, especially if you are a new trader. 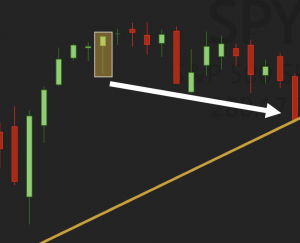 However, there are tools out there now (such as our platform, TrendSpider) that offer candlestick traders an automated option to show any time a specific candle pattern has shown up on a chart. 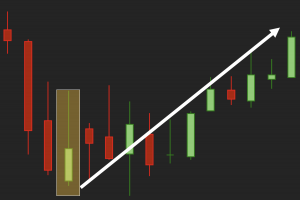 Shameless plug: TrendSpider can automatically detect dozens of common candlestick patterns on any chart in miliseconds. Try it for free. Details here. Whichever way you approach Japanese Candlesticks, they provide exceptional insight into market behavior and the psychology of traders for any given ticker. 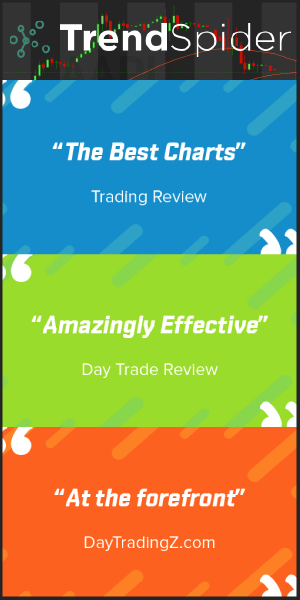 Once you learn to recognize them quickly or use the automated tools to do it for you, creating a trading strategy that fits with your own personality and trading style will lead you to success. Candlestick patterns are one of the oldest and most popular technicals to conduct technical analysis in the financial markets. Candlestick patterns are not an end-all-be-all to being successful in trading but they are a resource that can be helpful when looking for high probability trades when coupled with other forms of analysis. As trading becomes more automated and programmed, it will be interesting to see if these patterns continue to become more and more self-fulfilling as more eyes become latched on the same targets. 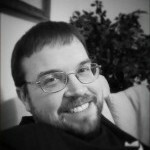 This has been a Guest Post by @TrendSpiderand originally appeared on their TrendSpider Blog. Should You Buy the Lyft Stock IPO?